Professor Kenny's lecture will take place on Wed 27th Sept at 6:30pm in Trinity College. 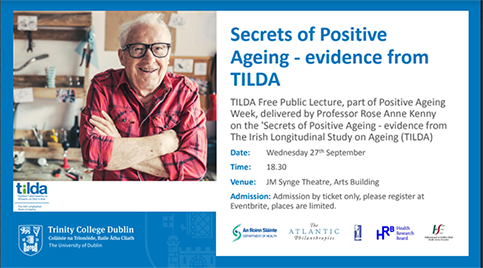 Entitled Secrets of Positive Ageing - evidence from 10 Years of TILDA research, the lecture will highlight TILDA's cutting edge findings on prevention of cardiovascular disorders, maintaining brain health and diet in Ireland. Professor Kenny will empower individuals to better understand the ageing process and therefore manage quality of life and physical and brain health. Professor Kenny says: "I will discuss the huge impact of the ten years of TILDA research in improving the understanding of ageing in Ireland and the incredible contribution of over 8500 participants to older age research in Ireland and to Irish society."